As you can probably imagine, I am on a lot of Facebook groups. I see many, many pictures of labeled soap and cosmetics. People send me soap labels to look at; they ask for my advice. I have a label review service. The net result is that I see a HUGE number of labels. Why do I mention that? Because close to HALF of the labels I see don’t include the net weight. The net weight of the product isn’t just a good idea. It is a key piece of information that is required on every product. The net weight is required on the front panel of the label. It must be in the bottom 30% of the label (when the product is standing up facing the consumer). It must be parallel to the bottom of the product. There must be at about 3/16″ empty space above and below the net weight (exact amount depends on the type used). The required type size and placement is not very pretty. It messes with the design of the label. It’s often inconvenient. It takes up a lot of room. All true. But just because you don’t like it doesn’t mean you can just skip the regulations. The fact that the net weight must be placed on the front panel is in law, as part of the Fair Packaging and Labeling Act (FPLA). In addition, most states have adopted some or all of the Uniform Packaging and Labeling Guidelines, which have the same requirements. The stated intention of the Fair Packaging and Labeling Act is to make is easy for consumers to make value comparisons between products in order to make informed purchase decisions. If two bars of soap are each $7.50, but one is 4 oz and one is 8 oz, the consumer needs to know that in order to make an informed purchase decision. The 8 oz bar may be cheaper by the ounce, but the 4 ounce bar may have other value in the ingredients or even just in the perceived value because of the packaging. The cost per ounce is not the only factor in determining value, but it is an important factor. By not putting the net weight on your products, you are not only violating the law AND existing federal and state regulations, you are also doing a disservice to your customer. Do what’s right – for yourself, for your customers and so the rest of us don’t end up with more regulations to enforce putting the net weight where it belongs. 1. ↑ If only upper case letters are used, measure the upper-case “L” in the font used. 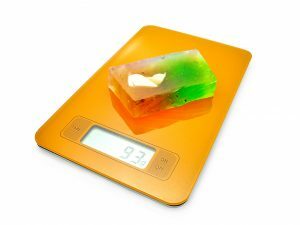 If the soap is smaller than 2″ x 2.5″ or it’s in a bottle smaller than about 2 oz, the type size may be 1/16″ in height. Thank you for all the research and simplification of the rules that you do! Your book is my go to book but I don’t remember soap having to be labeled with the net weight if you were going to be selling it just as soap and not a cosmetic. Am I remembering incorrectly? Net contents are always required. I understand the basic information needed on the label, but I did have a few questions. I live in KY and I just received an email from the Public Health official I’ve been asking questions of and he said, according to the FDA, I had to put “This product has NOT been tested” on my label if it isn’t made in a commercial food setting. I have been unable to find this on the FDA site. Is it true? I also asked him for the exact statues and regs on cosmetics, after reading the entire KRS 217 on Food, Drugs and Cosmetics. The only ‘laws’ they have on the books are for misbranding penalties, unadulterated penalties and definition of cosmetic (which is almost identical to the FDA). When asked about the specific law concerning a commercial food kitchen to manufacture cosmetics his reply was “Kentucky has always required that cosmetics be made to the same standard as food and made in a commercial kitchen.” No law stated, and no direction to a regulation website. Assuming at this point I’m going to have to pay a lawyer to inform me there are no ‘laws’ in my state and FDA rules apply, which means I can produce at home. Thanks so much for your site. Haven’t purchased a book yet, but plan to now. Spent the last three days reading every single post, all the way back to the beginning (and most of the comments). “This product has not been tested” is NOT required by the FDA. I have a woman who has promised me a write-up on her experience getting approved by the KY folks. She was given a document that specifically stated cosmetics had the same requirements as food. I’ve asked her for the material. Will try to do some research and post something about the KY regs as soon as possible. If you have any additional info, please email me so I can include it. I can use a commercial kitchen already certified, church kitchens, the pizza place down the street that is closed mornings etc. 1. Commercial kitchen to work from. 2. Mock up labels for me to review, make no health claims and make sure all ingredients and sub-ingredients are listed in the FDA GRAS list (generally regarded as safe). 3. We meet at the kitchen to inspect you and watch you make one of your products for me. 4. I permit you and turn you loose. But in light of the other information he has and hasn’t given me, I’m not sure. He seemed more like a salesman to be honest, and I have a business degree, so I’m not anxious to throw myself into a rental contract and buy a ton of supplies then find some obscure regulations I might or might not be breaking. I had specifically asked him for the Cabinet of Health and Family regulations on cosmetics, or Kentucky statues on cosmetics and he gave me the false info about the labeling and a statement on how things have always been. I haven’t even told him about the laundry detergent, fabric softener, air fresheners and non-abrasive cleaning scrub I want to sell, which I now make for myself and others have been asking about. I’m not even sure if his department covers them, because the laws are seemingly not there. I have read the Kentucky statue for Food, Drug and Cosmetics which is KRS 217, a simple search will direct you to it, but you won’t find cosmetics mentioned more than three times. I looked for the regulations on the Cabinet site and found cosmetics mentioned in a chapter title here: http://www.lrc.ky.gov/kar/TITLE902.HTM but that was the only mention, still no regulations stating I must have a commercial kitchen or any other requirements. It has been very frustrating, especially since I started with federal guidelines first and thought that was hard enough. Laundry detergent and those other things do not fall under food, drugs or cosmetics – so you shouldn’t have an issue there. I did find a brochure from KY, which seems to back up what he was saying, but it doesn’t (as you mention) reference any applicable regulations and the comments about cosmetics seem to be an afterthought more than anything else. The brochure is here: http://chfs.ky.gov/NR/rdonlyres/CC5DF026-6A6A-412B-BA25-59E9DDA2FF86/0/CommercialFoodManufacturinginKentuckyAStarterGuide.pdf the reference to cosmetics is on page 23. I did notice that the regulation cited for cosmetic labeling linked to in the brochure no longer exists, so it may have been repealed. that begs the question as to whether anything else has been changed or repealed and just isn’t (yet) updated on the website orr in their materials (or actions). He had sent me a link to the same brochure, and I noticed the broken link. The regulation page I linked to above was updated last month so I’m not sure that there ever was a law. He had said he permitted more people this year than in the last 17 he’d been doing his job. Had I taken him on his word I’d be permitted by now too, but I’ve been burned by false information before by an official (in another state, years ago) so I wanted to see the law to confirm myself what I need to do. I guess I’m going to have to find a lawyer to look into it for me and be certain enough to represent me if needed later on. I don’t know who else to contact, and I don’t really want to rock the boat and have them define it in the law. It would be a pain to make soap and candles at home then haul my stuff to a kitchen to mix bath salts and sugar scrubs. Hi Marie! Is there a requirement for the font of the net weight amount? It needs to be clear, of sufficient weight to be easily read (not super thin), not more than 1:3 in proportion (1 wide to 3 tall (so not really tall and skinny), in a contrasting color to the background, and not obsured by any images. There is no specification for a specific font. Hi Marie! I was reading on another post of yours about net weight labeling that if the label is less than 5 square inches your font can be 1/16″, but I do not see that information listed here. Is that still correct, or does it always need to be 1/8″? Yes, if the PDP is less than 5 square inches, then the text size may be 1/16th of an inch. Keep in mind that is the PDP size, not the label size.